Fairy food is beautiful, colourful and decorated with berries and flowers. 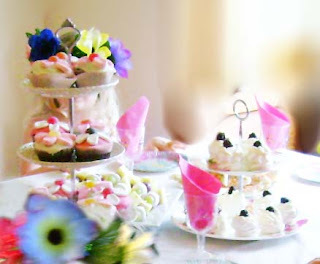 Try arranging it on tiered cake plates, for a garden party feel. Use the pre-made ones from the supermarket; make sure you get the "nests" which have a little hollow for putting cream in. Put a blob of whipped cream and top with a berry (defrost some frozen ones. the blackberries and raspberries look best). Use a chocolate cake mix and bake cupcakes in muffin papers. Ice with pink and white butter icing. The flowers are made with a jube lolly for the centre (but smarties look good too) and the petals are sliced marshmallows. Put white petals on the pink iced cakes, and pink petals on the white ones. Very simple, but look great! Use the short pastry sheets, and roll out flatter so the pastry is not too thick once cooked. Use a glass to press out rounds of pastry. Line muffin pans with baking paper and press the pastry rounds into each one. For the filling mash up some frozen mixed berries (defrosted) with some strawberry jam. Spoon into each pastry shell. Cut out hearts and stars using the left over pastry and place on top of jam mixture. Cook at 1800C for 10-15 mins or until pastry is cooked. Leave to cool and then turn out. Ingredients: Blackcurrent syrup or clear apple juice; Soda Water; 2 handfuls of Mixed Frozen Berries. Put about 1cm of blackcurrent syrup in the bottom of a glass jug. Clear apple juice can be used instead if preferred, in which case fill the jug about 1/3 with apple juice. Fill nearly to the top with soda water. Put frozen berries on top. The colour from the berries will tint the juice pink. This is such a light, healthy fizzy drink - that's also yummy and refreshing! Cut the crusts off 4-6 slices of white toast bread. Spread with low fat spread and then cut diagonally into 4 triangles. Dip into a bowl of 100s & 1000s. Arrange nicely on a plate. Easy peasey. Use low fat puff pastry; cut each sheet into 9 squares (3 across, 3 down). Place squares on a baking tray lined with baking paper. Spread with fruit chutney or tomato sauce & sprinkle with grated cheese. Cut 2 cabanossi sticks into slices and use for the flower's centre; place in the middle of the pizza square. Use salami slices for the petals, cut each slice into thin triangles, like bicycle spokes. Arrange around the flowers' centre to create petals. Bake in the oven at 1800C for 10-15 minutes or until cheese is golden and pastry is cooked. Ice cupcakes with red butter icing and make white dots by slicing white marshmallows in half. The ones pictured here are from Littlies magazine, and they cut dots out of rolled white fondant icing. I think marshmallow dots are easier and taste better! In theme with this and very yummy, I also had chocolate dipped strawberries. I melted a kingsize block of dairy milk chocolate in a bowl over a pot of boiling water. 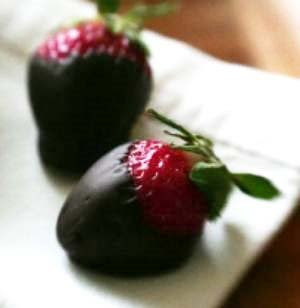 Then half-dipped the strawberries into the chocolate and laid them out on a sheet of baking paper to set. You have to work quickly or the chocolate starts to go grainy and won't dip easily. Dip the banana pieces in lemon juice and then roll in the desicated coconut. Yummy yummy yummy, and a great way to get kids to eat fruit at a party!